(In 2002 another 'Hurricane Hunter' story by Martha Watkins Gilkes was published in LIAT Islander titled "Wild is the Wind". 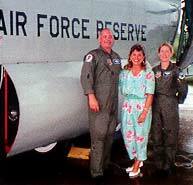 In 2003 Martha actually flew with the Hurricane Hunters into the eye of Category 4 Hurricane Fabian, read here about her adventures! Those who were in the Leeward Islands of the Caribbean in early September last year [1995, GvD] will remember the terrible fury of Hurricane Luis, the worst hurricane of the century, as it roared through the region for 36 hours causing damage almost beyond description. Whilst most who had a choice left the region, one courageous group of individuals actually chose to COME to the Caribbean specifically because of the hurricane, and meet the tempest on its own terms. This was an elite group of aviators, select men and women of the United States Air Force Reserve; the 53rd Weather Reconnaissance Squadron, otherwise known as the Hurricane Hunters. For 50 years, they have been performing one of aviation's most unique and perilous missions - seeking out and flying into the eyes of hurricanes. Home for the USA Hurricane Hunters is Kessler Air Force Base in Biloxi, Mississippi. Their missions span vast reaches of the ocean from the mid-Atlantic, the Gulf of Mexico, the Caribbean and mid-Pacific. Their WC130 four-engine turboprop is not specially reinforced as one might think. The only things that set it apart from an other aircraft are the special weather sensors and on board computers which instantly transmit information to the National Hurricane Center in Miami. As the data is received, it is analysed by hurricane specialists, who can forecast the storm's severity and predict is most likely path and ultimate landfall. Two specialist who make the WC130 Hurricane Hunters crew unique are Weather Officer, Nola Cary (left) and the Drop Zone Systems Operator, Lee Synder (right). Lee is holding a weather instrument sonde (right hand) which is dropped through a tube from the aircraft. The sonde free falls to the surface measuring atmospheric conditions which are radioed back to the aircraft and onto the US Hurricane Center in Miami, Florida. Six professionals make up the crew, and there is no room for error when you're flying a 70 ton aircraft sometimes only a few feet above a raging sea. The pilot and co-pilot handle the flight controls, whilst he engineer adjusts the aircraft's electrical and mechanical systems. The navigator tracks the aircraft position and fine tunes the radar to keep an eye on the ever-changing weather patterns. Two specialists make the crew unique: the weather technician, or Drop Zone Systems Operator, periodically ejects a weather instrument (called a sonde) from a tube in the aircraft. As the sonde free falls, it measures atmospheric conditions, which it radios back to the aircraft, to be checked for accuracy by the operator. The other unique crew member is the Weather Officer, the mission's science officer. As the aircraft system measures atmosphere and flight data at an amazing eight times per second, the weather officer analyzes this data using on board computers, applying personal observations and adapting the mission's profile to the changing weather conditions. A hurricane is the world's most powerful phenomenon - spiraling pack of thunderstorms between 300 to 600 miles wide. Its most destructive winds boil around the centre. The "eye" is a clear spot, usually ten to 40 miles across. Surrounding the eye is a solid ring of thunderstorms, the "eye wall", where the winds are strongest. When the hurricane makes land fall, the swirling eye wall winds can cause untold damage and injury. Hurricanes can also cause devastating floods, and some contain tornadoes, with up to 100 tornadoes sometimes recorded in a single hurricane. However, the deadliest threat is storm surge from the sea, which is responsible for nine out of ten fatalities. When forecasters at the National Hurricane Center detect a potential storm, a call is made to the Hurricane Hunters with a request that they investigate. Weather waits for no man, so they must react immediately, dispatching a team of air crews, maintenance personnel and several aircraft to an airfield near the storm. Whilst most flying units have at least three days notice to prepare for missions, the Hurricane Hunters are true Minute Men, who must be ready to embark upon extended periods of duty with often less than 24 hours notice. Tours of duty in this crucial and life saving job can sometimes last several weeks. This vital service offered by the elite Hurricane Hunters gives advance warning to those living in and visiting the Caribbean, information on which we are all dependent. In the 1900 hurricane in Galveston, Texas, over 6,000 people were killed as they were unaware of the approaching, raging storm. In modern times, with the accuracy of forecasts available, such a tragedy is unlikely to reoccur. And so... with the 1996 hurricane season officially set to begin on 1st June, those living in the Caribbean give thanks to these courageous men and women who help protect us, in the knowledge that preparedness is a key issue in preserving life and property. The author wishes to thank the 53rd Weather Reconnaissance Squadron for information provided for this article.